Our core mission is to equip the church to share the gospel at Christmas time. We'd like to help the people of your church exercise their faith by sharing the First Christmas Present™ with family and friends at a significantly discounted price. As the people of your church exercise their faith this Christmas, Jesus will be exalted, and people will accept Him as Lord and Savior. 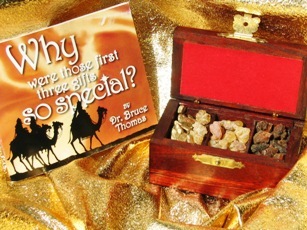 By receiving the First Christmas Present™, you will better understand Jesus and the significance of the gifts of gold, frankincense and myrrh given to Him. We will make a very special, deep discount offer to churches who want to purchase the First Christmas Presents™ in larger quantities. Below are our quantity discounts. Please be sure to check out refund/policy prior to your purchase.